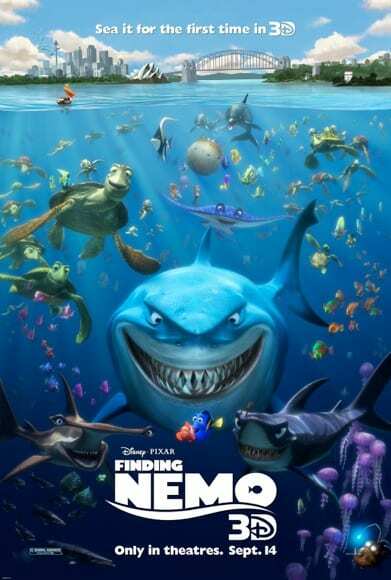 On September 14th, 2012 Finding Nemo 3D will be in theatres everywhere! Last month in Los Angeles, I was very grateful for the opportunity to attend an advance screening of the 3D version of this film. Even though I have seen the original theatrical release at least 100 times since it is one of my daughter’s favorites, there is truly nothing like seeing it on the big screen. I try to see every Disney and Disney/Pixar film in theaters, but somehow I missed seeing Finding Nemo in theaters. Seeing it as Finding Nemo 3D more than made up for it, and if possible, made me fall in love with this movie even more. As a parent, the strongest message in Finding Nemo 3D for me was learning to know when it is ok to let go. Marlin (Albert Brooks) is the single parent of Nemo (Alexander Gould); his wife Coral (Elizabeth Perkins) and all of their other eggs were eaten by a barracuda just outside the anemone they call home. Marlin has never quite gotten over the tragedy, and as a result, keeps Nemo barely more than fins’ length away from him. Even to just leave the anemone, Marlin makes Nemo go through a number of steps to ensure there is no danger lurking outside. Most rational parents are going to agree that Nemo is a pretty good kid; he listens to Marlin for the most part, but he also has a sense of adventure and is too young and experienced to realize just how dangerous the world can sometimes be. All it takes is one time of Nemo defying his father to learn this lesson–he swims out too far into the ocean and is captured by a well-meaning dentist who thought he was “struggling for life”. Now trapped in an aquarium in Sydney, Australia, Nemo has little hope that he will ever be reunited with his father. Marlin, on the other hand, will face his biggest fears–along with ones he never even knew he had–to find his son. Since their story is one I knew so well, I took the opportunity during Finding Nemo 3D to really immerse myself in Marlin’s and Nemo’s world. Seeing it in 3D is a great way to pick up on all the details that you normally miss out on when you’re watching on a much smaller screen at home. Since I love all things having to do with the ocean, my focus was most definitely on all of the various sea creatures and the underwater landscape. Finding Nemo 3D was so well put together; everything was sharp and clear, nothing was out of focus or blurry. There were several times that I even felt as if I were underwater, or that the ocean would flow right off the screen and into our audience. I loved that I was finally able to see this film on the big screen–which is the absolutely the best way to experience this amazing journey of a father and son who realize that their love for each other is stronger than any danger they will ever face. Make sure that you don’t arrive late to see Finding Nemo 3D; Toy Story’s Rex stars in his very own short animated film called Partysaurus Rex! In this laugh out loud short, you’ll be introduced to some exciting new characters as Rex visits a new part of Bonnie’s house–the bathroom! 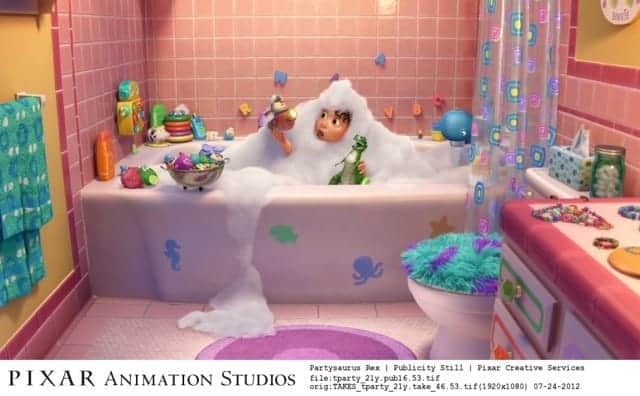 Buzz Lightyear, Woody, and the gang all think Rex is a “poop-a-saurus”, but Rex becomes the life of the party with all of Bonnie’s bath time friends. This is my absolute favorite of all of the Toy Story shorts. You definitely don’t want to miss out on all the fun!